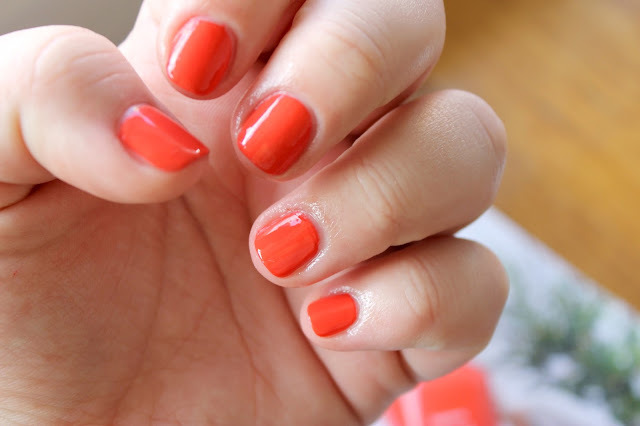 I'm totally in love with this orangey colour at the moment, even though it's more a Summery shade than a Winter one! I think Sally Hansen's 'Kook a Mango', would look absolutely fabulous with a tan in the Summer months and it's a different spin on the classic red. I'm also loving this formula, the 'Complete Salon Manicure' means there's a base, polish and top coat all in the one formula! It's a total no brainer really- this formula would be perfect for travelling or if you're a no muss, no fuss kinda gal! What do you think of this orange tone? Have you worn something similar, or is it something you might consider adding to your polish collection? Here's to another lovely week! The color looks so summer. Thanks Zarrah! I agree- very Summer time fresh! Anything orangey red is right up my alley, this is lovely! Loving a bright orange nail polish. Well picked! I got one from Benecos which is even more brighter but Orange is such a wonderful and happy summer colour the brighter the better. Hope you're well and we'll speak soon.